64 players took part in the Captain's Charity Golf Day on Friday 1st September. Nearest the Pin in 2 on 7th Hole : Simon Gravett. 1st with 87 points: Gillian Gravett, Hillary Pollard, Simon Gravett and Simon Pollard. 2nd with 81 points: Alan Fletcher, Barry Heath, David Coulson and Kevin Lewis. 3rd with 80 points: Harvi Johal, Sanjay Gupta, Ray Bhatia and Atin Patel. 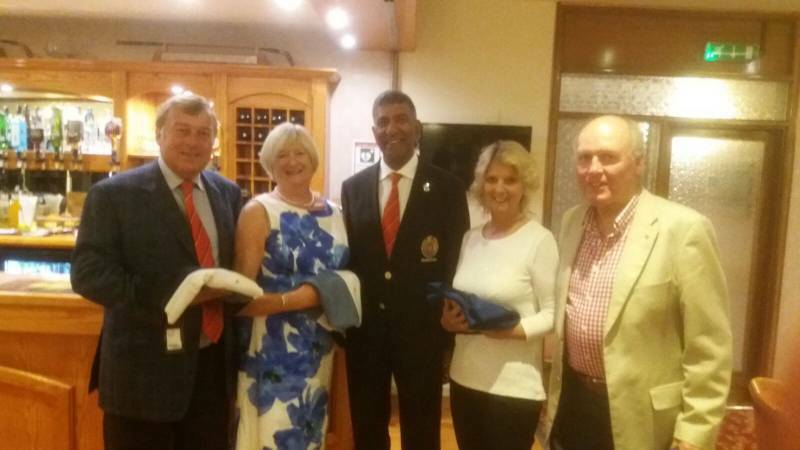 Captain Francis Lobo appreciates the support of all who took part in the golf and dinner and the very generous donations from many members who were not able to make it on the day. Special thanks to Michael Bucktin for his very charitable bid of £300 for the Leicester City shirt, signed by Jamie Vardy. Subject to final confirmation of the figures, Francis hopes to have raised approx. £2700 on the day, which when added to the £2000 already raised, should see the Charity sum go over £5000 by the end of the year.